WASHINGTON –– Fifty years after losing her father to war on the Korean peninsula, Pat Dunton can finally do more than just imagine his fate. She can bury him. For all those years, she and her family waited and wondered: Did he die when his Air Force B-29 bomber was shot down? Did he survive, only to perish in a POW camp? What became of his remains? Now, this Memorial Day, answers. With the help of DNA samples, military forensics specialists have concluded that remains received from the North Korean government in 1993 are those of Air Force Lieutenant James Swayne Wilson Jr., the navigator on a B-29 shot down by enemy fighters near the Yalu River on April 12, 1951. Dunton and other family members will hold a memorial service for him June 22, 2001, at the Ft. Myer Chapel, followed by burial next door at Arlington National Cemetery, with military honors. "I finally know what happened to my dad, and I'm bringing him home," she said in an interview. Wilson was 29 years old and had arrived in Asia to join the war just 16 days before his fateful flight. He was no newcomer to flying, though. He flew B-17s and B-24s during World War II, then got out, only to be recalled for his navigator skills shortly after the Korean War began in 1950. When he shipped out, his wife stayed behind in Tennessee. They planned to build a new house in Memphis for their young family. Dunton, born on her father's birthday in 1947, was 3½ years old when her mother received the news. "We are doing everything possible to recover your husband," the Air Force wrote. There was no search for survivors, Dunton found out later, because the B-29 went down in enemy territory. It was attacked by Soviet MiG-15 fighters while making a daylight bombing run against a Yalu River bridge connecting the North Korean city of Sinuiju and Antung, China. As many as three of the 11 men aboard survived the shootdown and were held prisoner. Two returned home when the war ended in 1953. In a wartime report to the International Red Cross and in radio broadcasts, North Korea claimed to be holding other members of the crew, including Wilson. But as it turned out – at least in Wilson's case – that was a lie. U.S. forensics experts were able to determine from his remains that he died in the crash, although that fact did not reach Dunton until last fall. "It is too hard to relate what I remember about him," she says. "It is more a sense of him than a specific memory. I felt safe." Wilson was among more than 8,000 U.S. servicemen who had not been accounted for when the Korean War ended in a stalemate. The truce was so tenuous that four decades passed before a U.S. military representative again set foot in that reclusive, communist country to recover bones of the missing. Between 1990 and 1994, North Korea unilaterally turned over 208 sets of remains that it said were American servicemen killed in the war. The first among those to be positively identified were three members of Wilson's B-29 crew: Lieuenant George Aaron, the pilot; Second Lieutenant Elmer T. Bullock, the radar observer, and Master Sergeant Robert Wilson Jones, the flight engineer. Wilson's dog tag was included with the remains, but it took mitochondrial DNA technology to confirm that bones were his. The burial at Arlington will mark the end of a long, emotional journey for Dunton, of Coppell, Texas, who has spent much of her 53 years combing military archives, questioning Air Force casualty officers, working with relatives of other missing-in-action servicemen and even traveling to North Korea in 1997 to observe a Pentagon search for the remains of MIAs. What she found on that lonely trail sometimes shocked her, often saddened her, always reminded her of why the Korean War, which killed more than 33,000 U.S. troops, became known as the Forgotten War. When the fighting ended, so, by and large, did the Pentagon's efforts to recover the missing or to inform their families. After Dunton turned 21 and gained legal status, as "primary next of kin," to request her father's military records, the Air Force casualty office told her it had kept no Korean War-era records of interest to her. "We threw out all of those records because we had to make room for Vietnam," she says they told her. When you hear Dunton explain what drove her to battle the bureaucracy for decades in search of answers, you understand, if only superficially, the pain the Korean War inflicted on thousands of American families. Dunton grew up wondering what stole her father from her life. She also faced the questions of her schoolmates. Did he desert your family? "It was a constant thing," she says of the reminders that her family was one of the unlucky ones. Now that her father's remains can be returned home for a final goodbye, Dunton feels fortunate, though reminders are still there. One is his final letter home, sent the day of his final flight. Looking back on it, Dunton believes her father was trying to shield her mother from the true dangers. "Don't worry," he wrote. "The only trouble we have is with the weather." Captain Wilson was a member of the 93rd Bomber Squadron, 19th Bomber Group. He was listed as Missing in Action while participating in aerial support over Korea on April 12, 1951. He was presumed dead on December 31, 1953. Captain Wilson was awarded the Air Medal and the Purple Heart. The funeral procession for Air Force Capt. 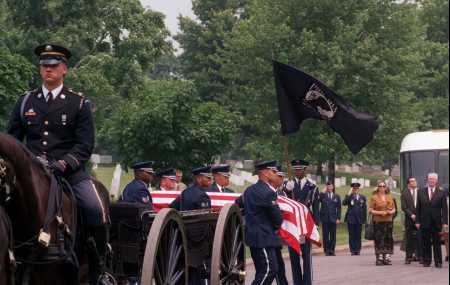 James Swayne Wilson Jr. heads to the burial site Friday, June 22, 2001, at Arlington National Cemetery. With the help of DNA samples, the military concluded that remains received from the North Korean government in 1993 were those of Wilson, the navigator on a B-29 shot down in 1951 during the Korean War.